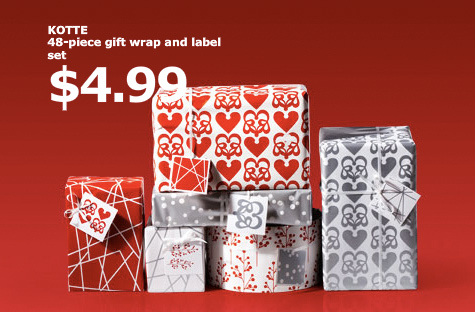 Kotte gift wrap by Ikea. This is my first holiday being in close proximity to Ikea, and I just love their options! Bold "Alice In Wonderland/Queen of Hearts"-like prints, modern double-sided red-and-white prints and kraft paper gnome and floral Swedish prints. The double-sided prints are awesome, I used them this year and I associated colours/prints with each person without having to get a bunch of crazy holiday patterns. Thanks, I had just convinced myself to skip Ikea this year (because I KNEW I would want to buy stuff), but this has convinced me. Trip to Ikea tonight!